One of the more unusual local sites with a claim to international fame is the Woodingdean Well. It was started in 1858 by Brighton’s Guardians more as a cost cutting exercise, than as an attempt to break a world record, but it did break a record and still remains as the deepest “HAND DUG” well in the world. initial plan was to sink a 6 ft wide, brick lined shaft down some 400 feet to the subterranean water table. All the soil dug out would be placed in buckets and hand winched to a platform at the top of the shaft where it could be disposed of. After 2 years of digging, the shaft had only reached a depth of some 438 feet, but no water had been found. Fearing that they had just missed the supply, the contractor gave instructions for a lateral chamber to be driven some 30 ft northwards, but this too yeilded nothing. Further lateral tunnels were driven westwards and eastwards, but none of them were successful. Failing to acknowledge defeat, the Guardians sanctioned the construction of a further 4 ft wide shaft at the end of the eastern tunnel. Work continued for several more years with men working 24 hours a day just by candle light in appalling conditions. Many removed their clothes and worked naked for within the confines of a 4 ft circle teams of men had to dig, load buckets and lay bricks. Winchmen stood on tiny platforms cut into the side of the shaft, passing spoil up and bricks down as the shaft continued forever downwards. One winchman actually plunged to his death. At the change of the evening shifts on Sunday 16th March 1862, the bricklayer noticed that the thin crust of earth he was standing on was being slowly pushed upwards like a giant piston. Scrambling up the numerous ladders to each winchman’s platform, he and the others quickly vacated the shaft. It must have been a difficult task for the well had now been sunk to such an amazing depth their successful exit took some 45 minutes. Suddenly with a roar, the piston head crumbled and tools, buckets and ladders flooded up the shaft. Water had at last been found. It had taken over 4 years backbreaking work for a labour force which included many Brighton paupers, to hand dig a shaft some 1285 feet deep (850 of which were below sea level) without the aid of machines. I would be very interested to know exactly where the Woodingdean Well was and whether there is any monument or marker there today. The well is located at the Nuffield Hospital site Warren Road, Woodingdean. Message for Jim Jasicki: There is a monument at the Nuffield Hospital just outside the entrance. I do not know if this is where the well was situated. I attended the Warren Temporary Secondary School which later became Longhill when the permanent school was finished along Falmer Road. We shared the premises of the Fitzherbert Roman Catholic School. I’m sure the well opening was within the Fitzherbert building, our headmaster Mr Robinson used to take us to see the entrance of it. Or did I imagine it? I attended Fitzherbert School in Woodingdean (the location of the current Nuffield Hospital) from 1984 to 1991 and can confirm that the well used to be below the metal-work room according to the headmaster, Mr Finny. At the time, Mr Robinson was a maths teacher and I remember him taking children to see it. Great school. I have seen this well… and even dropped a piece of wood down it.. funny though, I didnt hear it land. It was between the woodwork and the metalwork rooms, near the back of the Fitzherbert School. It used to have boarding over it. I went to Fitzherbert from 1984-1991 and yes it was in the metal work shop. There was a small red ramp that used to lead into the wood work shed that it was under and there were many stories of a nun’s body at the bottom of the well and I’m sure Stuart will agree with me that that end of the school was very scary! I went to Fitzherbert school, the same time as Wesley above, and also remember the same old tale of the nun at the bottom of the well. I can also confirm that it was in the woodwork room at the end of the school. Blimey, I had an operation in the Nuffield. It would kind of scare me to know that depth was below me. 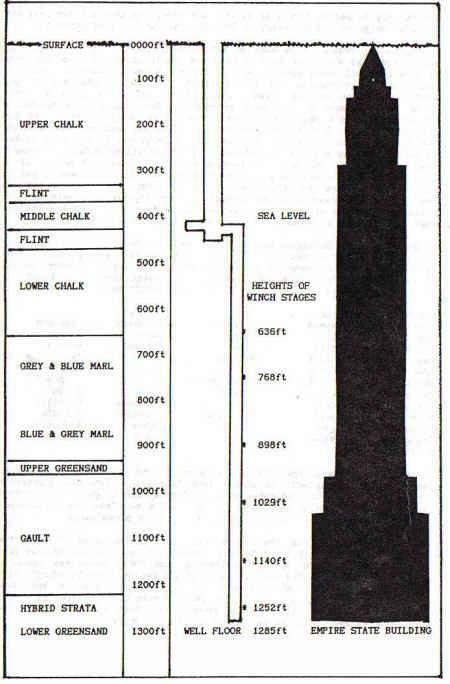 Although I live in Brighton, I was just browsing about deep hand-dug wells before I came across this, and many think that they have the deepest in Kansas at a mere 109′ (although to be fair they (still incorrectly) bill their well as the largest not the deepest). I went to Warren too. Everyone knew about the well (as kids do) `deepest in the country` and that it was located in Fitzherbert. Old Robinson (he was an acting headmaster as I remember and not connected to Fitzherbert when I was around – 1961 -1962) never took me to see it but I could see him doing it so maybe you didn`t imagine it. I am curious about certain aspects of the construction of this well. How were the walls supported to keep from collaspsing in? Was this necessary? Were the bricks put in place as the well was dug deeper? What would keep them there as the dirt was removed from below them? Anyone that can lead me in the direction to these answers would be “well” appreciated. PS. Apologies for my American brothers in their “biggest well” boast, as bigger is not always better, especially when its a lie! Matt, the well was constructed by a process called “Steining.” The digger / bricklayer dug down a short distance, putting the soil into a bucket as he went and it was then winched up. Then bricks were cemented round to support the last layer of bricks until more digging was required. More earth was then removed and so on. The process eventually resulted in a sort of brick built chimney that had been built from the top downwards into the ground. The records never mention any form of reinforcement, cross bracing or a temporary reinforced cylinder to protect the worker, they only state that eventually a steam traction engine had to be used to operate a pump to remove any pluvial waters that inhibited his brickbuilding task. Roy, I am doing some research on the well and I have a copy of the original article from the Brighton Gazette of 1862. Henry Catt sent a report to the Guardians of the Parish which he appended with three diagrams. Do you know if these still exist, and if so would it be possible to obtain copies of them? Thank you Roy. Using the word steining, I found a great site that has more on the old construction methods of wells. http://www.kurg.org.uk/sites/wells.htm. If link doesnt work, search krug well. The Woodingdean well is such a great story, I am amazed at stuborness of the man/men that ordered the project forward when it should have been stopped after a year. The well story is amazing. My father hand-dug three wells in his time the same way. About 10 feet across and 40 feet deep. He got to the surface water and then drilled a hole to 400 feet but, after all the effort, never put a pump in it! The full story of the sinking of the well appears in “The Hunns Mere Pit – the story of Woodingdean and Balsdean”. With what would seem such an important well, has anyone tried to find the entrance and been lowered down just to confirm all the reports? This is a fascinating feat of engineering – however we should not forget that the Cornish Tin miners far excelled that which was achieved at Woodingdean but not unusual for that period. The pump shaft of Fowey Consols dug some years later is 3000 feet deep and was reported to be 6ft in diameter and so straight that when standing at the bottom looking up ” daylight appeared smaller than a sixpence.” Much of this shaft was driven through granite!. Ok -no doubt dynamite was used – but never the less the working conditions at that depth must have been dreadful. The engineering feats of the Cornish miners in the 1850s are legendary -manhandling wooden pump shafts weighing tens of tons in very wet narrow vertical shafts hundreds of feet deep with no more that candle light. It is part of our remarkable engineering heritage which is little known by, or taught to, the younger generation. Hi, I have written an article re the well with information from the local newspapers of the time. I have had a 2D colour cross section drawing made of the well using the information as supplied by Henry Catt, and others. The article has been published in the WSGS Outcrop Magazine, Issue 40, Autumn 2009. If anyone would like further information then please contact me. I believe it’s at the entrance to the Nuffield hospital. Wow! I was born in Woodingdean in 1961 and one of my siblings went to Longhill in the early 70s. We had no idea there was a well in Woodingdean. I am gobsmacked. What a great story – it sounds like a truly remarkable feat of engineering. People today gripe and complain. Price of this too high, think what the price would have been to do this if the goverment was involved. Studies would run in the millions, city planners to pay offin the millions. For afficionados of ‘Well Digging’ they may be interested to learn that the wiley old late TV personality FRED DIBNA, more famous for knocking down factory chimneys and restoring steam traction engines once did a complete program on the craft of well digging. He dug a well in his own back garden and lined it in brickwork from the top down. This included the use of suspended cradles (which he fabricated in his yard) for supporting the brickwork whilst digging the next four feet. This whole feat was filmed by a TV production crew and Fred was helped at the top of the well with winch duties by his best pal. This part of the Dibna saga may still be available via the BBC Archives or iPlayer and the series is often repeated on the DTV channel “Yesterday”. I bumped into the old codger at various fairs and rallies and here is a tip for the young men! Be interesting! forget the trendy clothing and flash cars, at those weekend do’s Fred was constantly surrounded by ladies wanting to be photographed kissing him or being hugged by him yet he was dressed in filthy overalls, had a sooty face and always wore the greasiest cap you ever saw, and his mode of transport was a traction engine! There was a fatality during the construction of the well. It was of my 2Xgreatgrandfather’s sister’s husband. He was Thomas Marsh, aged 18 year old. On 1st December 1861, Thomas Marsh was lowered down the well using the “donkey” apparatus (a wooden board suspended at both ends by ropes). The one end of the wooden board broke off so Thomas was felled down the well at 150 feet from the bottom. He was killed by the impact at the back of his skull. An inquest was held at Rottingdean with the “accidential death” verdict – this was reported in all Brighton newspapers several days later. He left a widow, Elizabeth Marsh nee Harman, aged 16, with a four day old baby son, Thomas William Marsh. As it was an accidential death, The Board of Guardians which commissioned the construction of the well did not make compensation to the widow. Eventually, the widow remarried two years later and moved to London. Her son was left behind to be brought up by his grandparents, Nathaniel and Elizabeth Harman, in Bread Street, Brighton. Hi, is there anyone out there who went to Warren Farm School? I am researching a relic from the old school, and would love to find out more about it. I’m at martin.phillips97@ntlworld.com. Thanks Martin Phillips. I too went to Fitzherbert School. I was there from 1971-1975. The well, as I remember was under the metalwork room. Great old school too with lots of lovely memories and some great teachers especially Mrs Thomas (music teacher). I’ve just finished reading the new book by Simon Mayo (the Radio2 DJ) called “Itch” to my son. The Well forms a key part of the plot. I assumed it was fictitious but Googled it when we finished (just-in-case) and was amazed to find this page. I wonder how Simon Mayo knew about it? I have just listed a coin/medal that must have been presented to a digger of this well. I have just been researching it and came across this site. It’s on ebay from 6/6/2012, good luck. Like Phil Satchell above I also read ‘Itch’ and, being local, Googled the well out of interest. The detail in the book seemed very real so I guessed it must be real. I was surprised to find that the Fitzherbert School no longer exists. This is described in some detail in the book, although the buildings are described as being very run down. To answer Phil’s other question, Simon Mayo lived in the Broadwater area of Worthing and his parents were both teachers so probably had a reasonable knowledge of the local schools. It’s unlikely that a local school containing the deepest hand dug well in the world would escape his attention. This is fascinating. I really look forward to seeing the play. My grandfather and his siblings attended Warren Farm Industrial School in the late 1800s which seems to have been residential. From there he and his two brothers went into the army at age 12/14. Their parents lived elsewhere in Brighton and were very poor. It will be interesting to get a flavour of those times. I saw two of Jonathan Brown’s plays last night, ‘Silent Stream’ and ‘The Well’. Very highly recommended. ‘The Well’ in particular was highly original and powerful. I am grateful for the opportunity to experience a flavour of this episode in local history. It was very thought provoking. When the bottom of the well was reached, a small amount of clay was removed and taken to the potteries in Burgess Hill who made a flower vase out of it. It is thought it is now in the Brighton Museum. I have seen a picture of it. My mum was a dinner lady at Fitzherbet in 1970 I think and played the piano for a dancing school. Her name was Gloria – can anyone remember her? Does anyone know how high up the water came? Hello. I read a lot about that well, first time 6 years ago when I lived at home in Hungary. Now I’m live in Brighton. Today I went to finally see my favorite well and it was a disappointment. When I looked into the well, it was only 4 meters deep with 1 meter of water. The bottom under the water may be a concrete slab which covers the deepness, so the 120 meters deepness with the 6ft diameter is closed. Maybe when the hospital was built the builders closed the well with this concrete slab. There are some pictures about the well below, unfortunately that’s all I can show.If anybody knows anything, please post! Thank You Mr. Laszlo for the pictures you uploaded! Your pictures are the closest I will ever get to the well in which I am very interested. Matt, the place to do all research on any site in Brighton or East Sussex is ‘The Keep’ archive in Falmer. It is open 9.30am-5pm Tuesday to Saturday; there are the primary source records that you need to take ID to research from but also a lot of printed secondary material that is open access in the search room. Great (true) story – thank you. I subsequently found the following information on the British Geological Survey site in their database of borehole reports: http://scans.bgs.ac.uk/sobi_scans/boreholes/594236/images/14949519.html (next and prev at the top of the page to view the complete document). For anyone who requires additional info. This is spooky Roy! I was asked to go on BBC R2 this morning to talk about the Warren Farm Well on the Chris Evans show, and mercilessly foraged facts from your original article! Thanks! I was watching a video of deepest things inside the earth surface when I came to know about this wall and I must say it is fantastic. Fantastic, finally offical documents. Huge respect for you Mr Haughton. Now just one last thing. Does anyone guess what really happened to the well after all ? And is the monument at the hospital entrance the exact point of the former hole? Please let me know. Fred Dibnah used this method to dig the shaft in his backyard. Interesting how the water was under great pressure! That’s how the Fountains of the Deep opened up at the start of The Flood. I have, since 1992, helped train local people in Africa to hand dig wells with basic tools. So far the deepest we have managed is 18 metres deep. Digging by hand to over 400 feet is a good engineering trick. Thank you for this story. I shall use it to encourage diggers in the future. No Ben the BBC did not. Shame really because I was expecting them to do so, so got all my notes out and brushed up on the subject. Fascinating. Staggering that it could be done. I hope to visit some day. Is the well outside the hospital the original site then? If not, where is the hole now? I live in Woodingdean and catch the bus outside the hospital never knew about this! !